Here are some terms and explanations that can be useful. A blood test given to determine the presence of Equine Infectious Anemia (EIA). Veterinarians draw a small blood sample and send it to a laboratory. In many states, a valid negative Coggins Test is required for entry into activities such as shows, trail rides, rodeos and other horse events. Double-Rigged Saddle—A Western saddle with two cinches, one directly under the horn and a second behind the rider’s leg. An infectious viral disease characterized by a hemolytic anemia (whereby the red blood cells are destroyed), depression, intermittent fever and edema (abnormal collection of fluids in body tissues). It may be spread by biting insects, unsterile injection techniques or acquired from other horses. —An acute, infectious disease of horses and mules, which can be fatal. It affects the nervous system and is spread by mosquitoes, and, in some cases, ticks. Both the brain and spinal cord are affected. Horses should be annually inoculated to prevent infection. In the wild, a horse’s primary defense from predatory animals is to run away. Domesticated horses have that same trait. When a horse feels threatened or in danger, he will try to escape by running away. This is called the flight response. It is up to a horseman to position himself so that he will not be injured if the horse does try to escape from an object that the horse feels threatening. Offside strap running down from the front rigging ring on the saddle, which the cinch is attached to. A horse taking long leaps up a steep hill. This is dangerous because the animal could become unbalanced and fall over backwards. b) To step into the left stirrup and swing into the saddle. Refers to the left side of a horse. All saddling and bridling is done from the left side. 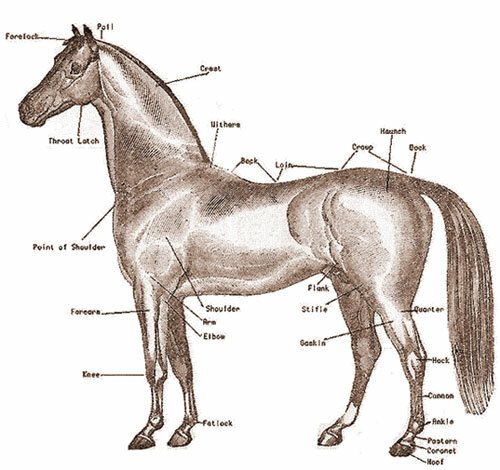 Off Side—Refers to the right side of the horse because the saddling and unsaddling is done from the other (left) side. It is sometimes referred to as the “Indian side,” because early Native Americans mounted and dismounted from that side. Metal rings attached to the saddle, which the cinches (girths) are tied to. A saddle will have two rings hung directly under the front (fork), and often a second set behind the rider’s legs. A specially designed snap that can be quickly unfastened under pressure. Used on halter ropes and trailer tie ropes so a horse can be quickly released if necessary. The technique of putting a saddle pad on the horse’s back slightly ahead of where it should fit and then sliding it back into position. This pushes the hair down and points it to the rear, helping to eliminate saddle sores. A term describing a horse that has gotten mad and refuses to move. horse’s neck just behind the jaws. The purpose of this is to prevent the horse from rubbing or pulling the headstall off against fences, limbs or other protruding objects. The short straps used to attach a breast collar to the rigging rings of a saddle. The height at which a horse is tied (normally approximately 5 feet from the ground) and even with the animal’s withers. If the tie point is lower, the animal could pull back and “pull its head down,” injuring it for further use. Or, it could paw with a front foot and get the leg over the tie rope. A horse should always be tied “withers-high” for safety. A hackamore is a type of bridle without a bit. It is designed to control the horse via pressure points on the nose and chin. There are three main types of hackamores, the mechanical hackamore, the side-pull, and the bosal. The horse has four natural gaits and a number of specialized ones, which are based largely on the pacing gait. This gait occurs naturally in some American breeds, notably the Tennessee Walking Horse, Missouri Foxtrot, The Fox Trotter and Rocky Mountain Horse, as well as in the Icelandic Horse, Mangalarga Marchador and Peruvian Paso. The natural gaits are simply walk, trot, canter and gallop. The sequence of footfalls at walk, when it is begun with the left hind leg, is: 1. left hind; 2. left fore; 3. right hind; 4. right fore - four distinct and regular beats. The trot is a two-beat gait in which the horse puts one pair of diagonal legs to the ground simultaneously and, after a moment of suspension, springs on the other diagonal. Two beats can be heard, the first when the left hind and right fore touch the ground, and the second when the opposite diagonal pair of legs touches down, following a brief interval. The canter is a three-beat gait. If it begins on the left hind, the sequence is: 1. left hind; 2. left diagonal, the left fore and right hind touching the ground at the same time; 3. right fore, which is then termed the "leading leg". On a circle to the right, the horse "leads" with the inside foreleg. On a circle to the left, when the sequence is reversed, the horse leads with its left foreleg. A horse cantering a right-handed circle on the left lead, or vice-versa, is said to be on the "wrong lead" or moving with a "false lead". The gallop is usually a gait of four beats, but the sequence varies according to the speed. As a four-beat gait, when the right fore leads, the sequence is: 1. left hind; 2. right hind; 3. left fore; 4. right fore, followed by all four feet leaving the ground. If you are considering a tour that offers rides on Icelandics, Mangalarga Marchador, Missouri Foxtrotter, Tennessee Walker, Peruvian Paso, Rocky Mountain Horse, or another gaited breed, you may want to know a little bit about what to expect. This section will give a brief overview about gaited horses and what you need to know about riding them. A gaited horse is much more efficient than a non-gaited horse because there is no energy wasted fighting gravity and free fall. This is one reason the gaited horses seem to have more natural stamina than his rough trotting counter part. The smooth ride produced by the gaited horse is another advantage of these efficient movements. · If you are used to riding a horse in a “round frame,” you may find riding a gaited horse quite different. In order for the gaits to be executed properly, the horse must keep a “hollow” frame, allowing his hind legs to slide under him. · In all of the Rack family gaits, the rider will feel as if they are sitting in the smooth center while action goes on all around him, there will be the feeling of the “horse climbing a ladder” as the front end has a fold which gives height to the front legs while the length of step is not increased. · While a head bob, or shake while riding a non-gaited horse often is a sign of lameness, it is typical in ambling gaits. A productive head shake actually contributes to the quality and square component of the gait. · The feel of the Rack gaits from the saddle is a very slight side to side sway, but the primary feeling is of the legs moving rapidly and independently. When moving into a rack family gait from a flat walk, you will have a "gear shift" feeling as the horse seems to literally leap directly up out of the flat walk into the rack family gait. This is due to the way a racking horse transfers the weight from one leg to another. The transfer is a "leaping" weight transfer. A straight pace is very easy to feel as it shifts a rider from side to side in the saddle and can be very uncomfortable and it is easy to hear the 1-2 beat of the 2 halves of a horse moving forward and back together. The Flying pace is a faster version of the straight pace and can achieve speeds of up to 30mph. The stepping pace is a smoother gait but there will still be some side to side shift to the rider due to the lateral lift of the legs. A rider should be able to see some side to side motion in the head of the horse, it can be a little seen at the poll and can also be seen in some side to side motion of the horses muzzle from the back of a horse. The fox trot gives a rider a forward and back motion, no side to side. This done correctly is also a smooth gait but one should be able to feel the lift of the hind legs and breaking of the hock action when the hinds are coming up and forward. There is a definite bump feel in the hind at a fox trot. The fox trot is a diagonal gait. It appears that the horse is walking with spirited action in front while trotting with the hind legs. The hind hooves reach well forward and touch down with a sliding movement. This gait is specific to the Missouri Foxtrotter breed. The rack and saddle gait are also smooth gaits but tend to move a rider a bit side to side due again to the lateral pick up of each side even though they are 4 beats in hoof falls. The saddle gait (stepped rack) is one that a rider can feel the shorter stride of the gait and feel a slight bump in the base of the spine due to the breaking of the hocks rather than the low sweeping hind legs of the running walk. In the rack gait feels faster. The rack has a lighter off the fore hand, up in front feeling, with more reach to the gait, covering ground faster than the saddle gait. A gait that is often described as being unique to the Icelandic Horse. In its pure form, the footfalls are the same as in rack, but the gait in the Icelandic horse has a different style with more freedom and liquidity of movement. The most prized horses have a very long stride and considerable lift with their forelegs. Icelandic Riders will demonstrate the smoothness of a tölt by going at the speed of a gallop without spilling a drink they hold. The Tölt differs from the rack as the horse is not supposed to hollow its back. The running walk is a gait where the rider can feel a slight, soft forward and back movement in the saddle. One should be able to feel the long low reach of the hind legs coming under the horse and the front pulling in the ground giving the sensation of floating across the ground. There are many types of riding one can pursue. Here are a few of the popular disciplines you may have heard of. The dressage phase (held first) comprises an exact sequence of movements ridden in an enclosed arena. The test is judged by one or more judges who are looking for balance, rhythm and suppleness and most importantly, obedience of the horse and its harmony with the rider. The challenge is to demonstrate that a supremely fit horse, capable of completing the cross country phase on time, also has the training to perform in a graceful, relaxed and precise manner. The next phase, cross-country, requires both horse and rider to be in excellent physical shape and to be brave and trusting of each other. This phase consists of approximately 12-20 fences (lower levels), 30-40 at the higher levels, placed on a long outdoor circuit. These fences consist of very solidly built natural objects (telephone poles, stone walls, etc.) as well as various obstacles such as ponds and streams, ditches, drops and banks, and combinations including several jumping efforts based on objects that would commonly occur in the countryside. Horse and rider must complete the course in the correct pattern and in the optimum time (which is at a brisk pace in most competitions). Show jumping tests the technical jumping skills of the horse and rider, including suppleness, obedience, fitness and athleticism. In this phase, 12-20 fences are set up in a ring. These fences are typically brightly colored and consist of elements that can be knocked down, unlike cross country obstacles. This phase is also timed, with penalties being given for every second over the required time. In addition to normal jumping skills, eventing show jumping tests the fitness and stamina of the horse and rider by generally being held after the cross-country phase. Hunt-Seat riding challenges a horse and rider to complete a course of 8 or more jumps in a ring. Hunter seat competitions in general are divided into three general horse show categories, hunters, equitation, and jumpers. Show hunters as a group are judged on manners, way of going, and conformation over a straightforward course. Jumpers are judged by how quickly a horse can complete a complex course of jumps with the fewest errors. Equitation riders are judged on the appearance of the rider and the smoothness and overall look of the horse and rider as a team. Wikipedia. “Hunt Seat.” Modified January 27th, 2009. <https://en.wikipedia.org/wiki/Hunt_seat> . Accessed February 24th, 2009. Dressage is often referred to as the ballet of horseback. Where riders ask there horses to perform different movements in a pre-determined pattern. Dressage starts at the most basic level where riders are asked to walk, trot and halt their horses – and continues through Grand Prix, where horse and rider perform complex skills such as piaffe and passage. At all levels, the horse is judged on his suppleness, responsiveness, collection, and rhythm. Western Pleasure is a western style competition at horse shows that evaluates horses on manners and suitability of the horse for a relaxed but collected gait cadence and relatively slow speed of gait, along with calm and responsive disposition. The horse is to appear to be a "pleasure" to ride. Horses that are calm, quiet, have collected, soft gaits and the strong muscling required to sustain slow, controlled movement are the most competitive. Reining is a western riding competition for horses where the riders guide the horses through a precise pattern of circles, spins, and stops. All work is done at the lope and gallop; the fastest of the horse gaits. Reining is often described as a Western form of dressage riding, as it requires the horse to be responsive and in tune with its rider, whose aids should not be easily seen, and judges the horse on its ability to perform a set pattern of movements. The horse should be willingly guided or controlled with little or no apparent resistance and dictated to completely. Cutting and Penning are equestrian events in the western riding style that involve controlling cattle from horseback. Cutting is where a horse and rider are judged on their ability to separate a calf away from a cattle herd and keep it away for a short period of time. The calf then tries to return to its herdmates; the rider loosens the reins ("puts his hand down" in the parlance) and leaves it entirely to the horse to keep the calf separated, a job the best horses do with relish, savvy, and style. A contestant has 2 ½ minutes to show his horse; typically three cows are cut during a run, although working only two cows is acceptable. Competitive Penning is a team sport where three riders have from 60 to 75 seconds (depending on the class or the sanctioning of the event) to separate three same-numbered cattle from a herd of 30, and put them into a 16' x 24' pen through a 10' opening, at the opposite end of the arena. The sport features 30 head of cattle, typically yearling beef cattle (mature cows or bulls are not allowed), with numbers affixed to their back, three each of each number 0 through 9. A run starts once the line judge has dropped his flag as the lead rider's horse crosses the foul line. At that time, the announcer gives out a randomly drawn number, such as "Your number is seven". The riders then know that they must cut out the three head of cattle that are wearing the number "7" and push them to the opposite end of the arena, and put them into the pen, and call for time. Wikipedia. “Western Riding.” Modified February 17, 2009. <https://en.wikipedia.org/wiki/Western_riding>. Accessed February 24th, 2009. Donna Snyder-Smith gives you an understandable map for mastering the foundation building blocks of communication and training of your horse. Understand PRECISELY where you are going BEFORE you start your journey, and you'll spend less time and money being "lost" along the all too common "dead end roads" within the equestrian industry. That most horses have poor posture when ridden? Do you know the natural aides? -- BUT YOU MUST ALSO direct the horse's selection of the muscle groups it uses to animate its skeleton, to influence its "carriage" or posture? Do you know horses are "trained" when their response to the rider's aids is consistent (habitual)? Do you know successful training makes the desired response stronger than an emotional choice? Do you know if you can't control the horse emotionally, you don't own the horse physically? Do you know when you can shape (not just confine) the horse physically, you can control their emotional energy?